If you have ever had to generate a document that contains Requirements, the Test Cases that validate them and the related work items you’ve most likely ended up using (at least) 3 different data sources and you’ve had to use Java Script to switch between APIs. Aside from a complex design, the performance of the report wasn’t that great as RPE had to crawl over all the data sources to fetch the required data. 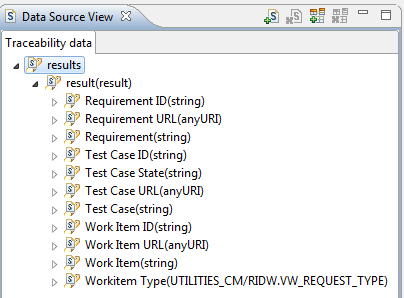 Using JRS 6.0 to fetch the same data from the Data Warehouse/LQE makes creating such documents much simpler. You can select, filter and sort the data with a JRS report and then use that report in RPE . And as described in How to embed JRS Charts in RPE Documents you can also include the graphical representations of JRS reports. Using the JRS query as a data source for RPE simplifies the template design and increases the runtime performance. In many scenarios you will only need a single data source which has a schema that is simple and clean since it contains just the data you need. Add to this the fact that you can filter and sort the data in JRS and the conclusion is that you can focus on the document layout in RPE and leave the data aggregation and selection to JRS. NOTE: not all the data is available through JRS since not all the data properties are stored in the DataWarehouse. Rich text data and images are among the missing properties, You can obtain them however by making individual calls through the Reportable REST APIs while still taking advantage from JRS providing the structure of the document. Here is a template that produces the traceability document. I have kept it minimal to increase the dramatic effect. And this gets better as you can add test case results, execution records, child work items and much more. I hope some one could help me check datasource null before getting values of attribute passed to template elements. – create a template has a table contain 4 rows.2 cells for each row. – create datasource get from report. – each row i define title at firts cell, and get data of attribute from datasource. => after run template the output file is blank. i would like to check data source if the data is null i will pass 0 values for each cell above. It’ very faster than creating “classic” RPE report (Reportable REST APIs). The only problem is that I cannot get DNG text artifact Primary test. The post states “Rich text data and images are among the missing properties, You can obtain them however by making individual calls through the Reportable REST APIs while still taking advantage from JRS providing the structure of the document”. It’s not clear for me how can I mix in RPE studio a call from a “DNG text artifact” and a “JRS result”. It is possible to have an example? In the Cell that prints URL, insert a Container element. Within Container, add Data Source Configuration (DSC) element. You should be able to print the richText (dataSource/artifact/content/text/richTextBody/div) using a query on DNG Text. Meantime I’ve noticed that If I add”&rpe=true” to the report URL at least the Primary text is exported, so for the moment I’m gonna try this way.